Hero bystanders have helped save the life of a man injured in a car accident by turning their own clothes into bandages. 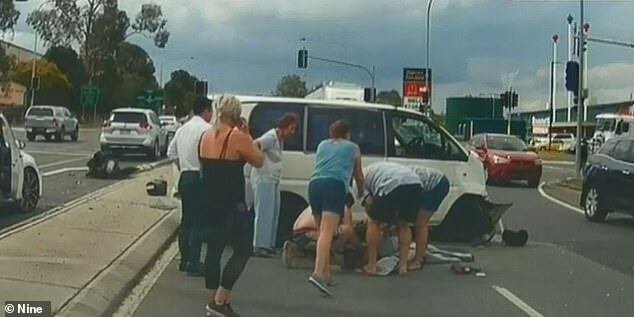 Footage of the rescue effort shows people scramble to help the man as he lay on a busy road while semi-conscious. Some bystanders came to the 50-year-old victim’s aid by tearing off their own clothes and turning them into tourniquets in a bid to stem the bleeding. The crowd also administered first aid and provided words of support to the man before paramedics arrived. ‘Just keep those eyes open for me buddy,’ one can be heard saying in the video. Kevin Martin recorded the startling clip and told 9News of how the shock situation escalated. ‘You’re just seeing absolute chaos,’ he said. In the vision, debris can be seen strewn across the road, with the injured man firmly at the centre of the carnage. The injuries occurred after he struck traffic lights on on Blunder Road at Oxley, in Brisbane’s south, before the vehicle rolled. Luckily the vehicle’s other passenger was uninjured and the man at the centre of the chaos was taken to hospital where he remains in a stable condition.